Purchased as a set, will sell one, both or all 4 pieces together. Original orange gold finish throughout. WAS $295.00 . . . 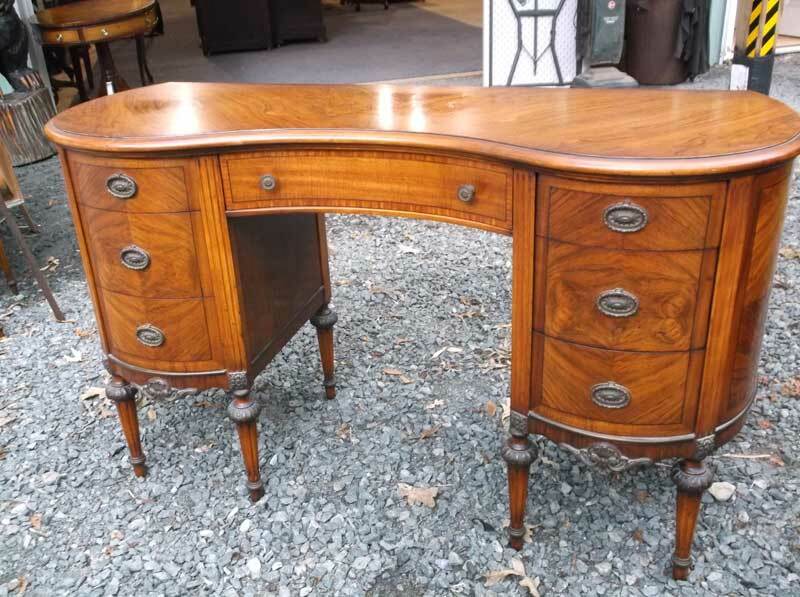 Very pronounced graining in this lovely vanity. Mirror pivots as needed. Pad feet, gracefully curved legs, pierced crest on mirror. Golden Yellow color, original finish. $395.00 Refinished to natural T.M. 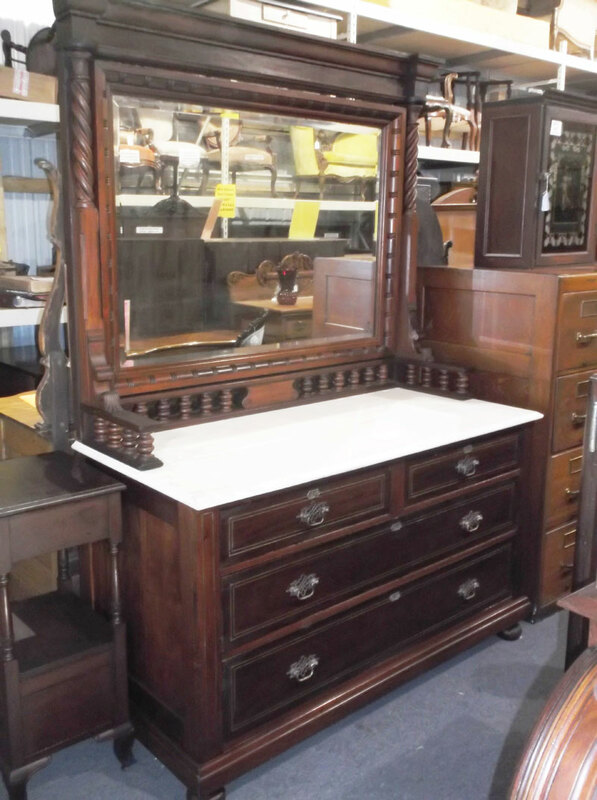 Solid walnut, circa 1885, raised panel design, single drawer with 2 doors below, shelf inside. WAS $395.00 . . .
Talk about a head turner! Circa 1840 pair of Victorian twin beds, professionally married side by side to create a King Bed. Uses a steel frame to support mattress. Massively carved. burled walnut everywhere, this really MUST be seen in person to truly appreciate the workmanship in it! 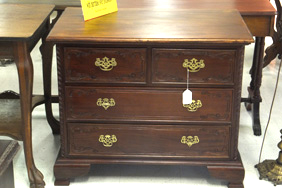 Gorgeous flamed mahogany fronts adorn this circa 1840 tall chest. Wonderfully shaped gallery above, also with flamed veneer. 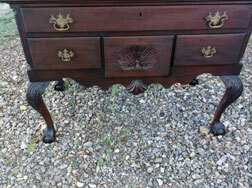 Shown as found, will be completely cleaned, detailed and restored with new correct knobs prior to delivery. 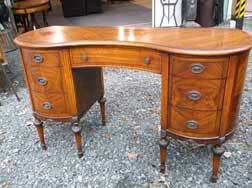 Circa 1800, SOLID Tiger Maple and Cherry Dressing Table with 1 large drawer and 2 smaller drawers above. Nicely turned legs, great looking graining. Completely restored and ready to go. Beautiful carved walnut Victorian headboard alone, gorgeous applied carved scrolls, shield and massive finials. Large enough to be used as either full or queen size. 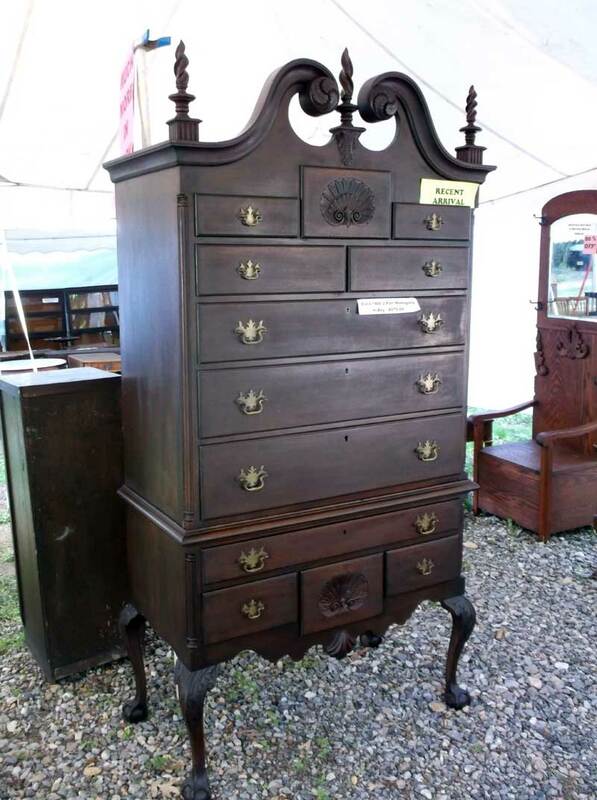 Smaller size, possibly a child’s, solid walnut, gallery on top, original hardware and finish. 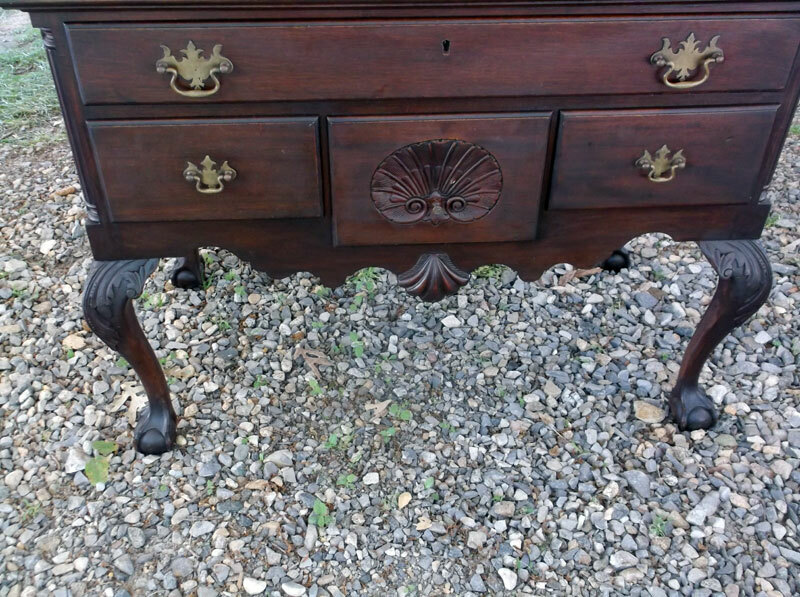 Flat top vanity or desk, kidney shaped, beautiful rosewood veneers with satinwood banded edges, seven drawers total. 4 graduated deep drawers, good figuring in the graining, smaller size. Later 20th Century, Mfgd. 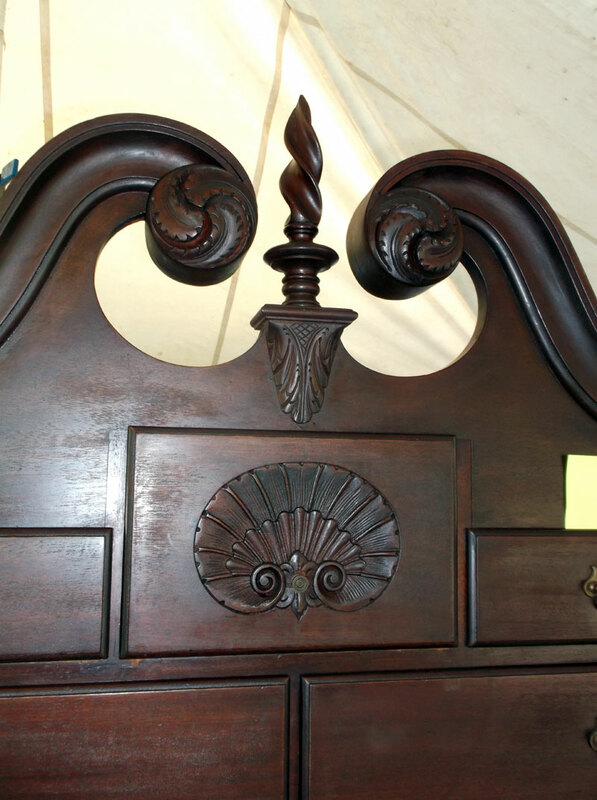 By LEXINGTON FURNITURE, “Vestiges of Our Past” Series, fluted columns, domed and carved headboard. Very solid and good quality furniture. Small Bow front dresser with tall pivoting mirror above. Matches 01-639 low dresser and 01-641 Full Bed. Dark red mahogany color and finish. Buy alone or all three. Impressive Oak Bonnet Chest, Bonnet compartment can house up to 3 bonnets, oval beveled pivoting mirror. Original hardware and applied carvings. Great original finish and color. IMPRESSIVE! Solid Walnut, hidden drawer at bottom, raised panel burled drawer fronts, white marble top w/Walnut backsplash.